HannahArendtLibrary is a Legacy Library. Legacy libraries are the personal libraries of famous readers, entered by LibraryThing members from the Legacy Libraries group. » Hannah Arendt's legacy profile. HannahArendtLibrary is also an author. 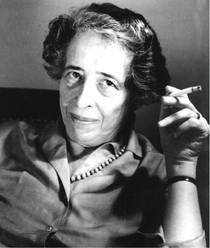 » See Hannah Arendt's author page. About meHannah Arendt (1906-1975) was a philosopher and political theorist in the mid-20th century. Born to secular Jewish parents in Hannover, Germany, she fled to Paris in 1933 and moved to New York in 1941 (she returned to Germany briefly after World War II). Arendt's writing addressed key aspects of modern political and social life as well as the historical roots of the Western tradition. She taught in various capacities at a number of U.S. institutions, including Princeton, Chicago, Berkeley, and the New School. For her biography, see Hannah Arendt: For Love of the World, by Elisabeth Young-Bruehl. For her correspondence with Mary McCarthy, see Between Friends. Arendt's major books include Eichmann in Jerusalem, The Origins of Totalitarianism, On Revolution, The Human Condition, and The Life of the Mind. Reviews of her thought are available at the Internet Encyclopedia of Philosophy and at the Stanford Encyclopedia of Philosophy. About my libraryLibraryThing member pranogajec initiated and supervised the cataloging of this collection. Assistant LibraryThingers were katkat50, mambo_taxi, rsterling, and Voracious_Reader. The collection is cataloged from the Arendt library held at Bard College. The collection website is available at http://library.bard.edu/search~S0?/darendt+hannah+1906+1975+personal+library. Tags, which are not yet complete, follow a modified Dewey system for simplicity's sake: Philosophy, Psychology, Religion, Sociology, Politics, Language, Science, Math, Education, Art, Literature, Literary criticism, History, Geography, Biography, Music, Economics, Periodical, Travel, and Bard Arendtiana (for items added by the Bard library and not part of Arendt's original library). In addition, books tagged annotated have marginalia that has been scanned to pdf and made available on Bard's website; you can find links to those pdfs in the comments field, or check out the complete list on Bard's website.